Today in Masonic History John McLean is born in 1785. John McLean was an American Supreme Court Justice. 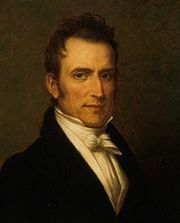 McLean was born on March 11th, 1785 in Morris County, New Jersey. After moving around to various frontier towns, the family eventually moved to Ridgeville, Warren County, Ohio. It was in Ridgeville that he received his formal education and developed an interest in the law. He graduated from Harvard University in 1806. It was around this time that McLean developed his strong anti-slavery opinions. In 1807 after returning to Ohio, McLean started the Western Star a weekly newspaper in Lebanon, Warren County. He also at that time read law and be admitted to the bar. In 1810, he turned the Star over to his brother and began to practice law. In 1813, he successfully ran for the United States House of Representatives. He served in the House until 1816 when he was elected to the Ohio Supreme Court. While on the Ohio Supreme Court, McLean was presented with his first slavery related case. In the case a man who was held as a slave sued for his freedom under the basis that in Ohio slavery was illegal and since the Kentucky slave owner was sending him to Cincinnati for weeks at a time, he was relinquishing all rights of ownership. In this case, McLean wrote in his opinion “Were it proper to consider it, the Court, as well as from the principles recognized by our Constitution and Laws, could not hesitate in declaring that SLAVERY, except for the punishment of crimes, is an infringement upon the sacred rights of man: Rights, which he derives from his Creator, and which are inalienable." It should be noted that the word slavery in all capital letters is how McLean wrote it in his opinion. The Ohio Supreme Court found in favor of plaintiff in the case and he was set free. McLean became Postmaster General in 1823 and served during one of the largest expansions into western states. He was also Postmaster General when it was elevated to a cabinet position. He stepped down as Postmaster General when he was appointed by Andrew Jackson to the United States Supreme Court. On the Supreme Court, McLean was nicknamed "the Politician on the Supreme Court." He associated himself with every political party across the spectrum. Starting as a Jackson Democrat, then an anti-Jackson Democrat, the Anti-masonic party, the Whigs, the Free-soilers and finally the republicans. He sought the nomination for President from the Republican party twice. The second losing to Abraham Lincoln. The most complicated case that McLean faced while on the Supreme Court was the case of Groves V. Slaughter. The case involved a man who purchased slaves from a slave-trader then tried to get away with not paying the slave-trader by claiming that the law prohibited the slave-trader from selling slaves in Missouri. At the time there was great fear that if the Supreme Court struck down a states right to decide whether it was a free state or not would allow slavery to migrate into the northern states. McLean passed away in Cincinnati, Ohio on April 4th, 1861. McLean is listed as a member of Columbus Lodge No. 30 in Columbus, Ohio. Although there is some question on the legitimacy of this claim.